2007 - "8/9/2007 – Matt Stevens Dominates YET AGAIN at Oswego Speedway’s Dirt Kartway +YouTube"
The front cover to this week’s DVD. Click for a printable version of this cover. More made to order. On August 9th, 2007, five members of the Galletta’s Go-Karts Club raced in Oswego Speedway’s Dirt Oval Kartway in the Gas Stocker division (formerly known as the Super Yard Karts). (Above photo by Xtreme Photography). 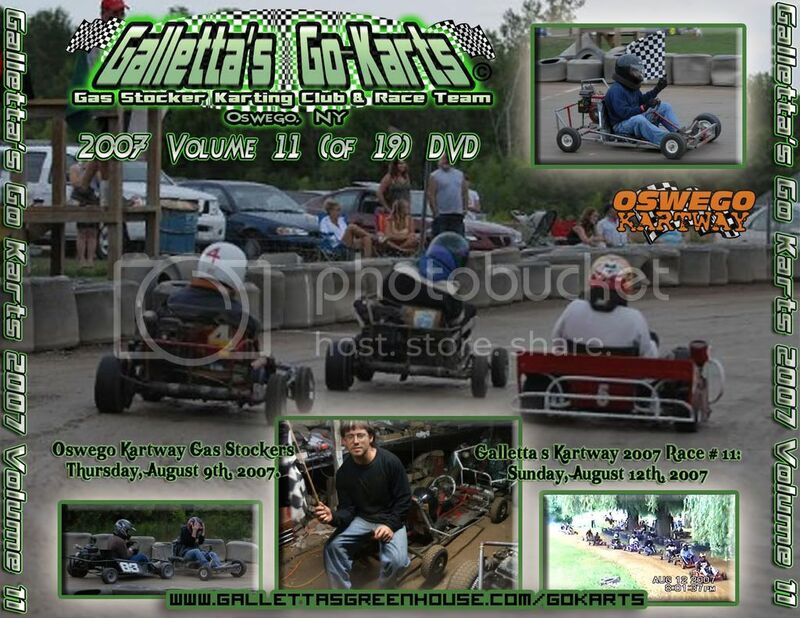 All pictures and video clips are from the Galletta’s Go-Karts 2007 Volume #11 DVD. Buy one today. The back cover of this week’s DVD. Click here for a printable version. Other weeks made to order. Aug 9, 2007: Matt Stevens has been the most dominant area karter for years. He proved again, winning another mixed-motor race at Oswego Speedway’s Kartway! In fact, he set up five of the seven karts on track, and the top three were all his karts (driven by himself, Kyle Reuter, and Mike “MC” Howell) and all with SMALLER motors than the other two! The Feature was won by Matt Stevens in the Galletta’s #33, and was followed by Kyle Reuter in the Galletta’s #0, Mike “MC” Howell in the Galletta’s #6, Eric Raponi in the OHV #83, Wes Ogre Stevens in the Galletta’s #4, Missy Berry in the Galletta’s #7, and Joe Hayden in the OHV #5 did not finish. The heat was won by Eric Raponi in the OHV #83, followed by Kyle Reuter in the Galletta’s #0, Matt Stevens in the Galletta’s #33, Mike “MC” Howell in the Galletta’s #6, Joe Hayden in the OHV #5, Wes Ogre Stevens in the Galletta’s #4, and Missy Berry in the Galletta’s #7. The next Oswego Speedway Gas Stocker Kart race is Thursday, August 16th, 2007 afternoon behind the back grandstand at Oswego Speedway. The next Galletta’s Speedway Points race is set for Sunday, August 19th, 2006 behind Galletta’s Greenhouse. The racing is set to begin at 6:30pm, but if you are a rookie or an irregular competitor and you plan to rent (or if you have your own kart and plan to enter the show) please get here around 6:00pm and sign in to speed things up. We love having tons of racers, so keep coming! Thanks! For our “Gas Stocker division” at Oswego, the rules are: (1) Gas only, (2) Racing slicks, (3) No more than 8 horsepower motor. The awards for all classes will be: 1st Place – A pass to the International Classic Weekend and a big trophy. 2nd Place -Friday Pass to the ISMA nationals, and a trophy. 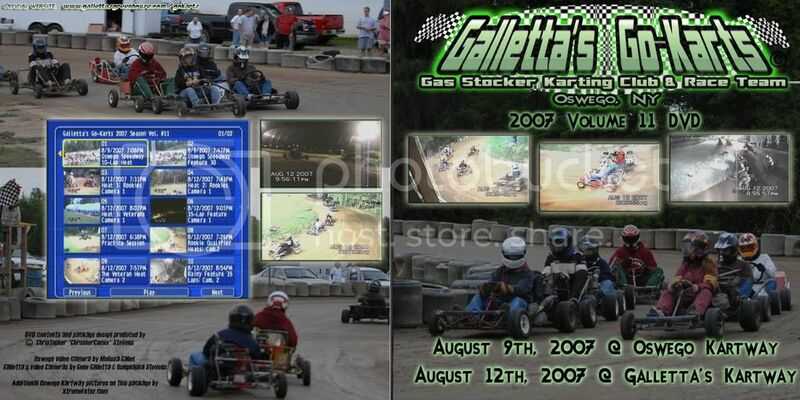 Contains the August 9th, 2007 Gas Stocker Kart races from Oswego Speedway, and the August 12th, 2007races at Galletta’s. 2 hours & 10 minutes. Aug 9, 2007: Matt Stevens has been the most dominant area karter for years. He proved again, winning another mixed-motor race at Oswego Speedway's Kartway! In fact, he set up five of the seven karts on track, and the top three were all his karts!